We know Verizon will be shipping WP7 handsets in 2011, and the general assumption it’ll be very, very soon rather than later — early January has been knocked about as a date by a number of people. Here’s an indicator that we might be seeing big red getting in on the Windows Phone 7 business in the very near future: a handful of Verizon branded apps have landed in the Marketplace. 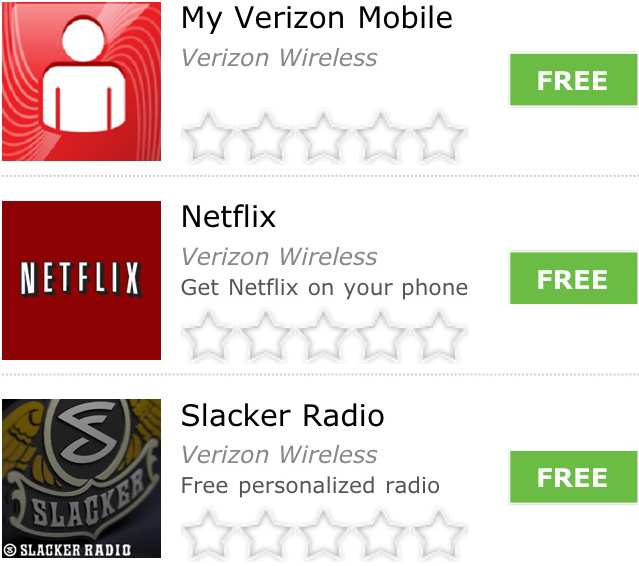 The Verizon versions of Netflix and Slacker Radio aren’t thought to be any different from the standard editions, but might come pre-installed on Verizon phones. Any of our readers on Verizon and eagerly awaiting Windows Phone 7? I am indeed. I have to believe the delay has something to do with alliances/positioning with Google (Android), but as long as this doesn’t turn into the typical, “Opps, hang on, I meant early next quarter” BS, I’m good to wait a few weeks to avoid switching to a new OS. My hesitation is mostly based on 3P apps I have that I don’t want to have to figure out whether I can migrate to a different OS (Pocket Player, Splash aps, Sprite aps, etc.). I hear Android is a nice OS; I just want to be able to choose w/o having to change carriers. As a consumer, I don’t think that’s too much to ask. We’ll see.